Josh Schache expedited his travel plans. As the footy world soaked up the start of September the Western Bulldogs sharpshooter and housemate Brad Lynch jetted to the US. The duo sat in the Dodger Stadium stands as LA piled on a run-fest against the New York Mets and then watched Philadelphia outlast Indianapolis Colts in the NFL. Then, with more than a month left on the holiday clock, Schache returned home and got to work. “I’ve put on 4.7kg,” Schache said before ‘Handball Club’ at Whitten Oval, where Bulldog youngsters were joined by Tom Liberatore, Liam Picken and Jackson Trengove. “That was my goal over the off-season, to get in the gym more and do more swimming and I’ve been eating more to put that extra weight on. “I feel like that’s where I can catch a little bit of a break to other players. Schache has confused his scales in recent years as his weight fluctuated. In 2015 he was drafted at about 96kg. Then, at the Brisbane Lions, he peaked at about 103kg. Last year Schache shed 10kg — cutting out carbs as he trimmed down to about 93kg — and right now he has beefed back up to 99kg. The plan is to maintain the gains over summer. Then, he is hopeful it will make him harder to move in 2019. It’s been a turbulent ride for the No.2 pick, who has eked out 40 games and 42 goals in three seasons. 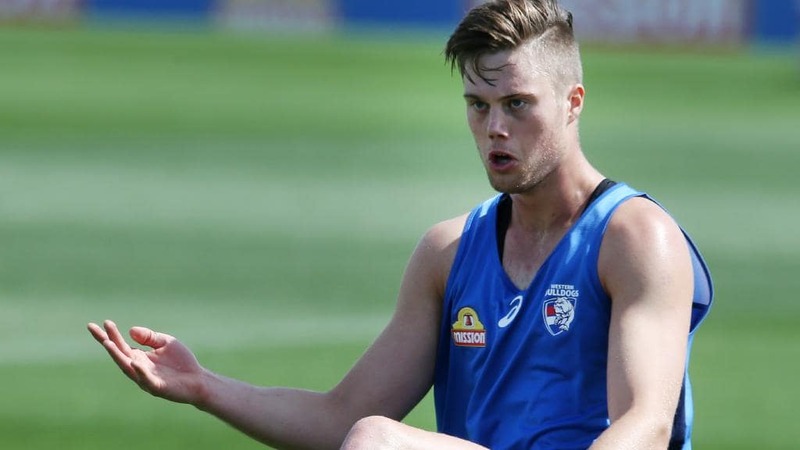 But the 21-year-old has never been happier, living just minutes from Whitten Oval with Lynch and Bailey Dale and returning to Seymour most weekends. It was at the Seymour Football Club where he was been pumping weights in October. “It’s pretty quiet in there and they’ve got everything I need,” Schache said. Then there’s the swimming, also completed back at his hometown. “Mainly freestyle,” Schache said. “I’d get up to 1.5km some sessions in a bit under half an hour. “I don’t mind swimming, so I’ll get in there most days and it works your upper body a bit more. A long-time strength of Schache’s is his set-shot routine, likened to a fluent golf swing in his draft year. Schache spins the Sherrin three times, walks eight steps, jogs four steps and kicks. “I try and walk straight, jog straight and kick straight and then hopefully the ball goes straight,” he said. Marked into his 2019 diary will be more video analysis of the game’s best key forwards alongside coach Ash Hansen. Jack Riewoldt is a favourite of Schache’s while coach Luke Beveridge highlighted a defensive trick of Josh Kennedy’s game. “I was talking to Bevo before and he brought up how Josh Kennedy’s short steps really complement his team defence,” he said. This year Schache said the goal was to “have a lot of fun and learn a lot” as he enjoyed being back into Victoria. Next season is simply about building on that. Sounds like a tall Daniel Cross fanatic with food watching and stupid amount of training. I have no problem handling half that equation, and it's done me the world of good. Seems like he really was in a bad headspace at Brissie. Despite my pessimism as the trade went through, we really do seem to have snared ourselves a bargain here. He'll be good for 1.5 goals per game and play both the get out option and a linkman role for us. Vital for our structure. He's possibly going to be our most important forward in 2019 based on how he finished the year. Agreed. Smoothe mover, covers a bit of ground and a nice kick. If he can continue his upward trajectory he'll end up being an absolute steal. 1. Back to work before he was even back to work. 3. Targeted weight training to address deficiencies. 5. Picking up small habits to help the team. This kid is a beast in waiting. 1500m in half an hour is damned impressive for a non swimming athlete as well. Pfft. I can run faster than that. One of the bright lights and at times the only reason to watch the footy last year. If he improves again and the team as a whole can improve and give him better opportunities to make an impact then he could be in for a real good year. I want him to turn on BEAST MODE !! Imagine schache and Gowers on beast mode ? Me too, that much time gives you heaps of chances to stop and rest. Yeah. Frankly it's embarrassing that it's even being talked about.